Gothic Revival. Large brick church with irregular massing. Main body has two crenellated towers of uneven height with tall round-arched windows. Building on south is 8-bay, 2-story brick with crenellated entrance porch. Brick addition on west in vaguely Gothic style was completed 1953. Doors on Rivermont side replaced with double wooden doors with slight ornamentation. Church was completed in 1911 to the design of the architectural firm of McLaughlin, Petit, and Johnson.The building is an early work by Stanhope Johnson before he settled into the Georgian Revival style. It is a well preserved example of the Gothic Revival style and defines the corner of Bedford and Rivermont Avenues. 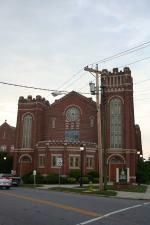 The congregation was organized in 1886 and built its first church on Cabell and H streets ( this church is now MT. Carmel Baptist).